I have been asked by my neighbors, why weed whack your lawn? Is your lawnmower broken or something? I usually answer their questions with a question of my own. 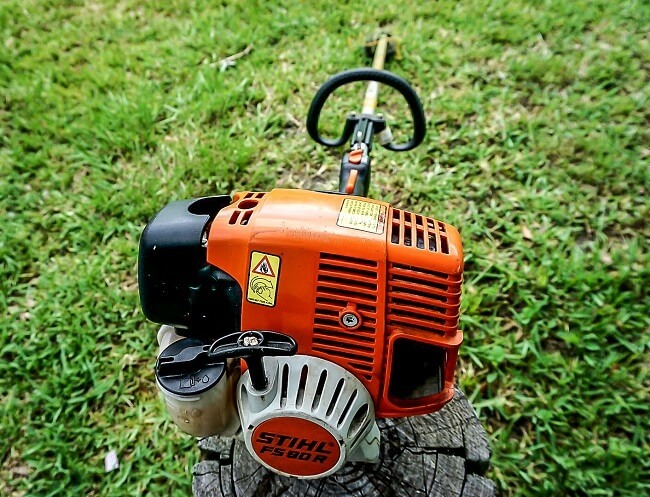 Who needs a lawnmower when you have a small yard and a Stihl FS 90R? Sure operating a professional grade trimmer isn’t for everyone but for me it makes perfect sense. Let me tell you why. I can cut my little yard in a fraction of the time it takes me with my push mower. With a push mower, the strips you can cut are proportional to the deck size you are working with. My little Murray has a 22-inch deck but my arms can reach much wider than that. When I am using my weed wacker I can cut a much larger area. Cutting a larger area means making fewer passes and the less walking you have to do, the faster the job gets done. My Stihl FS90R uses significantly less fuel than my push mower. I can usually cut my lawn two times on one tank of gas. I have to fill up my push mower every time I cut the grass. I am all about saving money. Fuel costs seem to be on the rise again and there are many other things I would rather spend my money on than gas. If you want to weed whack your lawn like a pro you only need a few things. 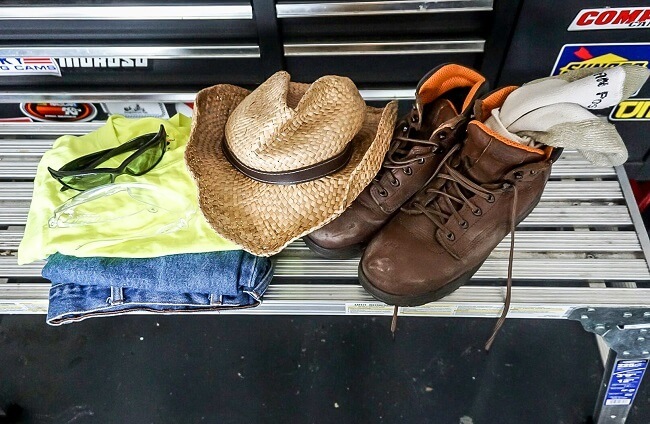 With a professional grade trimmer, long pants, work boots, good socks, a brightly colored shirt, eye protection, and a hat you’ll be well on your way to trimming like a pro. To get started just take the handle in one hand the cord in the other and pull until you get it started. Once you’re fired up you are ready to rock and roll. With your feet shoulder-width apart, your arms hanging low, and your knees slightly bent just rotate your body from side to side as you walk forward blazing your path. Bend from the knees and not the waist. Be sure to rigidly hold your stance to keep your cuts uniform. Some scalping is inevitable when you’re learning but rare with a little practice. To make it easier to cut consistently even, I remove the trimmer guard so I can see what I’m doing. The guard really obstructs your view. 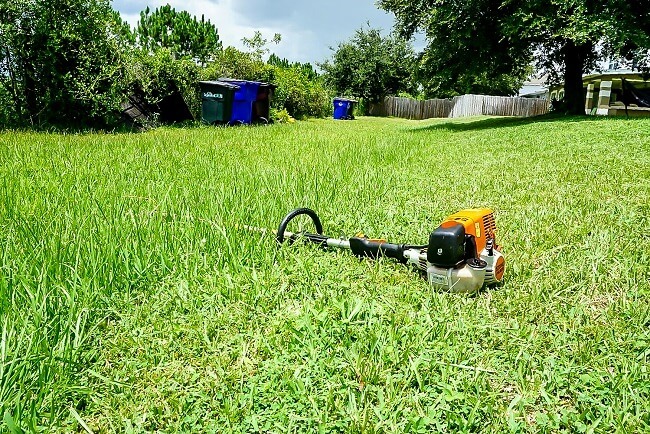 Sure removing it makes trimming a bit less safe but as long as you do a thorough walkthrough of your yard and remove all debris and remember to wear your long pants and Personal Protective Equipment (PPE), you should be just fine. Just pay attention to what you are doing and what is going on around you. You don’t want to damage yourself, someone else, or anyone’s property. Use common sense. Make sure you do a thorough walk through and pick up any debris, Also be careful around mulch. It can kick up easily and sling through someone’s window. I have had a few close calls but thankfully, I’ve never damaged anything trimming. With a little practice and the right equipment, you’ll be weed whacking like a pro in no time. How much experience do you have with a weed wacker?